Ask the Knitters: Which yarn should I get? 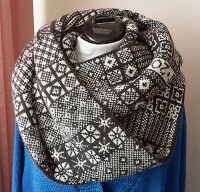 I posted about the Sanquhar Cowl by Wendy D. Johnson a while back. Even though I’ve been obsessing about it ever since, it hasn’t hit my needles yet, for two reasons. First, I’ve been working on other projects. Second, I haven’t had the available funds for the yarn. Well, progress is definitely being made on the existing projects, so the first reason may not be a factor any more. And, some wonderful friends gave me a gift card to WEBS for Christmas, so I may be able to afford a bit of a yarn shopping spree. I’ve narrowed down the yarn options to three potentials, and now I’m stuck.